Home › Uncategorized › Sussex TEL’s Festive Countdown. 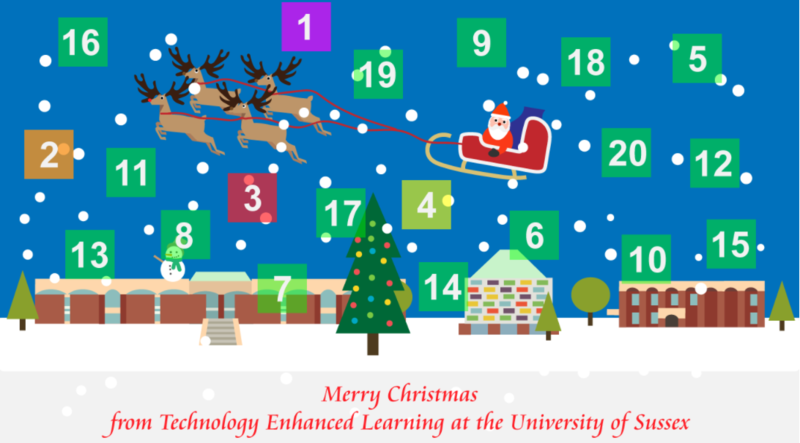 Technology Enhanced Learning’s very own Elf, George Robinson, has been busy making a countdown to Christmas calendar full of TEL goodness. Each day from 1st December to 21st when the University closes for the year, there will be a window to open with a guaranteed zero calorie treat. We’ll be sharing some of the most popular blog posts and podcasts of the year, giving you a peek into the personalities that make up the team, and playing with some apps we love. Catch up now by clicking on the image above to see the first few days and follow us on Twitter to get a daily alert to the next fun tidbit.